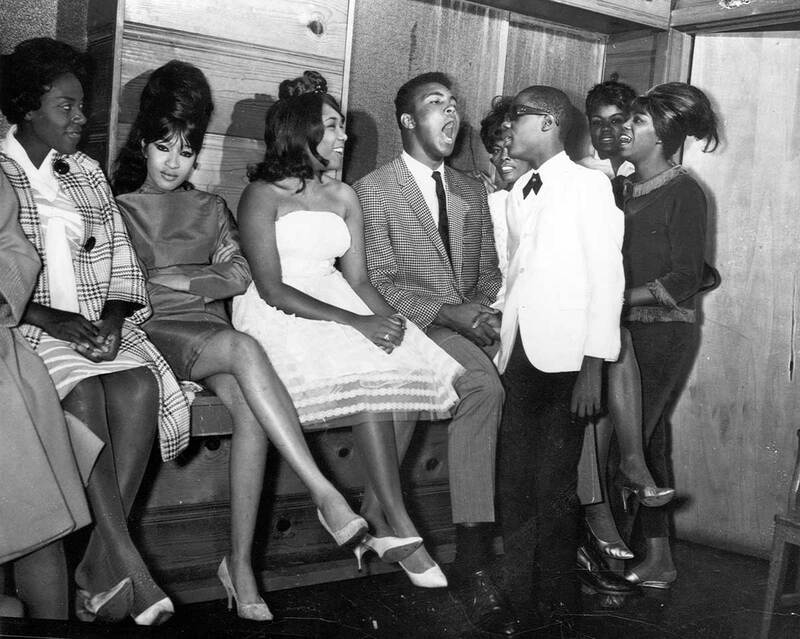 Ali, though, had an accomplice, one who in his own right, at the peak of his notoriety, was one of the most photographed Black men of a generation. 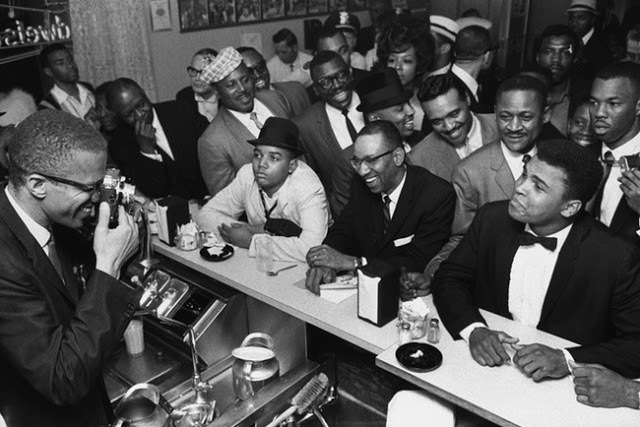 In the aftermath of Ali’s death, much has circulated with regards to his all-too-brief though powerful relationship with Malcolm X (with Sam Cooke and Jim Brown as fellow travelers). Politically linked as Ali’s “Blood Brother,” Malcolm X shared a passion for photography--and Ali was often his willing subject. There is something striking about the subject of so much photography, being lensed so often with a camera in his hand or on his person. As Maurice Berger writes in his essay, “Malcolm X, Visual Strategist” the Nation of Islam Minister, “a keen steward of the Nation of Islam’s visual representation, Malcolm X often carried a camera...He relied on photographs to provide the visual proof of Black Muslim productivity and equanimity that sensationalistic headlines and verbal reporting often negated.” (New York Times, 2012). Berger adds, “If Malcolm was a talented visual strategist behind the camera, he was nothing less than a prodigy in front of it. Well before the rise of photo ops and People magazine, he endeavored, with considerable sophistication, to prepare himself — and the community he led — for the penetrating, and often unforgiving, eye of the news media.” Indeed this is likely a sensibility that Malcolm X passed on to his friend Ali, whose obvious love of being in front of the camera was exploited in creation of a generous archives of now digital, material that provides so much depth into our understanding one of the most iconic figures of the 20th Century. Ali has been the subject of many photographic collections--Benedikt Taschen’sGOAT being one of the most well-known (and expensive). 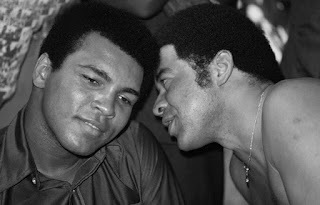 And of course, one of Ali’s closet friends and confidantes was photographer Howard Bingham, who published his own collection Muhammad Ali: A Thirty Year Journey, in 1993. Bingham’s photos like those of Malcolm X are significant for the methods in which they capture BlackSpace -- what we might think of that conflation of private Blackness with the interiorities of Blackness -- those embodiments not necessarily intended for consumption, but rather to be loved, and adored and desired in the intimacy of Black Lives. In this regard those images of Ali--relishing in the contours and crevices of what have been simply described at the time as the Chitlin’ Circuit--resonate with a generation of young Blacks for which hand-held devices and visual platforms such as Instagram and Snapchat have reimagined the Black visual archive in a digital moment marked by a devotion to the intimacy of Black Bodies across time, space and place. Whereas some might see the ways that Blackness has encompassed social media as emblematic of the limits of so-called hyper-consumption (tethered to legitimate concerns about the Surveillance State), Krista Thompson, suggest “private consumption may be seen as indicative not of the demise of the political but of the changing ways people represent their interests in the face of widespread disenchantment with long-standing political institutions, which have changed the meaning and possibilities of politics.” (Shine: The Visual Economy of Light in African Diasporic Aesthetic Practice, 30).